'The collection of goose-foot shaped deng from the Western Han (dynasty), Jingning period (belonging to Master) Cheng Muan from Xinan'. 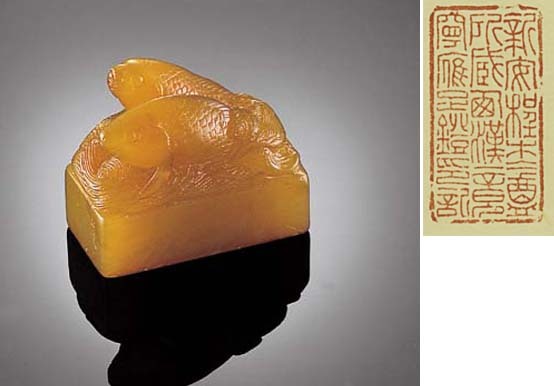 From the text, the present seal was most probably used for verifying a collection of rubbings taken from archaic bronzes that once belonged to Master Cheng Muan. Rubbings from early bronzes were a popular past-time from as early as the Northern Song period. The bronzes in Master Cheng's collection, according to the seal impression, was from the Jingning period which is the fourth, and last, reign period of the Western Han Emperor, Liu Shi, and is equivalent to 33 B.C. The two-character mark on one vertical side of the seal read: Yu Xuan, which is the zi (designation) of the Kangxi period craftsman, Yang Ji, but this is probably a spurious mark.